Radcliffe started acting in school plays when he was in primary school. When he was ten years old, he played the part of the young David Copperfield in the TV show David Copperfield. In 2001, he played Mark Pendel in the movie Tailor of Panama. 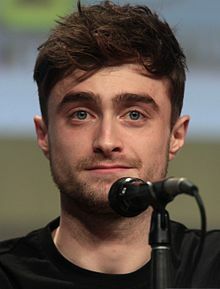 Later that year, he was chosen to play Harry Potter in the movie Harry Potter and the Philosopher's Stone (called Harry Potter and the Sorcerer’s Stone in the United States). He has also played Harry in the other Harry Potter movies. This page was last changed on 23 March 2019, at 01:28.